The ancient Egyptians were extremely accomplished builders, almost unmatched in their use of stone to build enduring monuments. On this page you will find links to pages about pyramids, mastabas, rock cut tombs, temples, palaces, and statues. Pyramid building in ancient Egypt began with Djoser in the Third Dynasty (around 2650 B.C, orthodox chronology) and is most associated with the Old Kingdom. 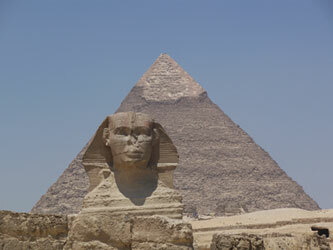 The most famous examples are the pyramids of Giza and in particular the Great Pyramid. However, pyramids were erected by a number of the Pharaohs during the Middle Kingdom. During the New Kingdom, Pharaohs were buried in the Valley of the Kings, but the workmen who built their tombs were interred in miniature pyramids. Numerous small pyramids were built in Nubia between the Eighteenth and Twentieth dynasties, and the Saite Period (the twenty-sixth dynasty) saw the return to Egypt (at least in Thebes and Abydos) of small pyramid-like tombs. Most of the pyramids of ancient Egypt were clearly used as tombs, and from the Fifth Dynasty they generally included a version of the “Pyramid Texts”, “Book of Gates” or the “Amduat” (That which is in the Underworld). It is still disputed whether the Great Pyramid was ever used as a tomb.In addition to the pyramids of the major sites there are also seven small pyramids (also known as “minor step pyramids”) scattered along the edge of the Nile which are dated to the third and fouth dynasties. The name “mastaba” derives from the arabic for “bench” as these tombs resemble a large bench when viewed from a distance. A rectangular structure (with its length commonly being about four times its width) covered and protected a deep trench which held the burial and burial provisions of the deceased. This form of tomb was favoured by the Predynastic and Early Dynastic pharaohs but was rarely used for royal burials after the development of the pyramid by Djoser’s architect, Imhotep during the Old Kingdom. However, the mastaba remained popular with non-royal Egyptians. The earliest mastabas are located at Giza, Naqada, Tarkhan (Kafr Ammar or Kafr Turki) and Saqqara (Sakkara). These early mastabas were decorated with the palace facade design (serekh) which did not provide an entrance to the tomb. By the Second Dynasty the outer wall of the mastaba was simplified, but included two false doors to allow offerings to be presented to the deceased (who was often depicted on the door along with an offering table). From the Third Dynasty the false doors had developed into small beautifully painted chapels. Mastabas were often built from mudbrick, which has a tendency to degrade over time. As a result we know that there were mastabas in many other locations (such as Abydos) but they have not survived the ravages of time. Luckily some of the mastabas at Giza and Saqqara were built from stone and so they have endured. Egyptians temples were seen as the houses of the gods to whom they were dedicated, and were the focal point of the rituals and festivals associated with those gods. Because the ancient Egyptians built their tombs and temples of stone and often located them away from the banks of the Nile (but built their homes and palaces of mudbrick and often located them closer to the river) we know a great deal more about these structures. However, there are exceptions to this rule. Malkata (Malqata) Palace (the palace of Amenhotep III on the West Bank near Thebes) was built from mudbrick and from stone and its location means that at least some information can be gleaned from its remains.